We know you couldn't be with us on September 10th - You were busy saving old women and crying babies from a burning building. We hold no grudges on our end. As a sign of peace and forgiveness, we share with you the videos from season 1. Just as we promised, these women will make you want to pack your backs and leave right now. Now you know what went down on the first session. It's like being there with us during the actual day. Except it's not. We hope you'll be with us on the next Sole Sister event. It's more fun, really. Episode 2 is up next! 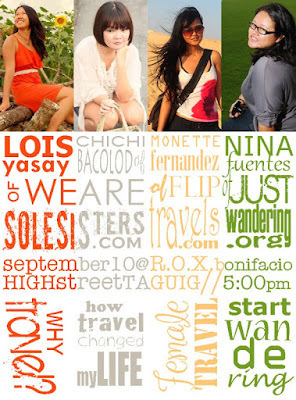 These videos were filmed and edited by Russel Patalinghog of LifestyleCreatives.com. This event is in partnership with Recreational Outdoor Exchange (R.O.X. ), Roomarama and South East Asian Backpacker Magazine. this was the only day that I missed. thanks for recording gals! Enjoy Ed! And big thanks for resisting the helpless women from that burning building just so you could be with us on the 2nd and 3rd sessions! yeah I will :) I really loved too! We will be speaking at the Belle du Jour Power Planner launch on Oct 16. Hope to see you there!